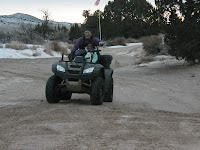 Cheesy Chongo's Cheap Chat: Sand Dunes in December! Ted took Daesha down to the sand dunes today. I stayed home with Keegan because I dont like the cold and I didn't want to get any sicker than I already am. Ted's Mom and Dad went as well as Pam and Ed. 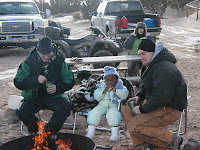 Ted said that Daesha went on a ride with him but after that she just wanted to stay by the camp fire. Her job was to make sure the fire didn't go out. She loved finding sticks and throwing them on the fire. When they got home I asked Daesha if they had a good time and she said yes but I burnt my hot dog! She said it was black but she ate it anyway. I bet her Dad had something to do with making her eat it. I thought the pictures of them all bundled up were pretty funny. That just looks way to cold for me. Daesha looked like a real trooper, I bet she had fun. I'm with you, I would have stayed at home where it's warm. Wade would be too jealous if I let him see this post, so can you delete it? haha/j/k. I think the pictures look fun, I would have stayed at home though too! hey!! i don't know if you are into swaps, but i'm hosting a new years resolution swap and would love for you to get in on the action! haha just go to my blog to get the dish and deadline to sign up is tonight!